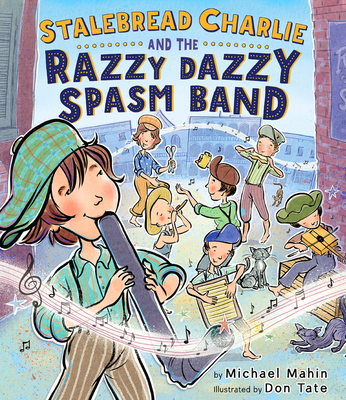 Based on a true story, a vibrant, inspirational picture book about self-reliance and the power of creativity and music, in which a group of hungry homeless kids in 19th century New Orleans build their own musical instruments from discarded items and become a successful band. It's 1895, and ten-year-old Stalebread Charlie and his friend Warm Gravy roam the streets of New Orleans, homeless and hungry. Stalebread has heard folks say that music feeds the soul—and he wonders if it could also fill their bellies. Soon he and his friends are playing instruments made out of junk—a fiddle from a cigar box, a kazoo from a comb—until their hats are filled with coins, their bellies are filled with beignets, and their souls are filled with music. This inspiring make-lemonade-from-lemons tale includes author/illustrator notes about the real Stalebread and the research behind the book and a make-your-own-instrument activity. Michael Mahin enjoys writing about people who use music to make the world a better place. He is the author of the New York Times Best Illustrated book Muddy: The Story of Blues Legend Muddy Waters illustrated by Evan Turk and he lives in San Diego with his wife, two kids, and not enough guitars. Visit him online at michaelmahin.com and on Twitter @MahinWriter. Don Tate is an award-winning author and illustrator of many books for children, including The Cart That Carried Martin by Eve Bunting, Whoosh! Lonnie Johnson's Super-Soaking Stream of Inventions by Chris Barton, and Poet: The Remarkable Story of George Moses Horton, which he also wrote. He lives in Austin, Texas. Visit him online at dontate.com and on Twitter @Devas_T.